7 Tips for Business Security | Blue Star Security "Chicago's Finest Protection"
Whether you are in the business of providing a service to a customer, or providing a product, there will always be a risk factor with the information that you handle; for both you and the customers. It is a good idea to put safeguards in place before any major problem comes up. 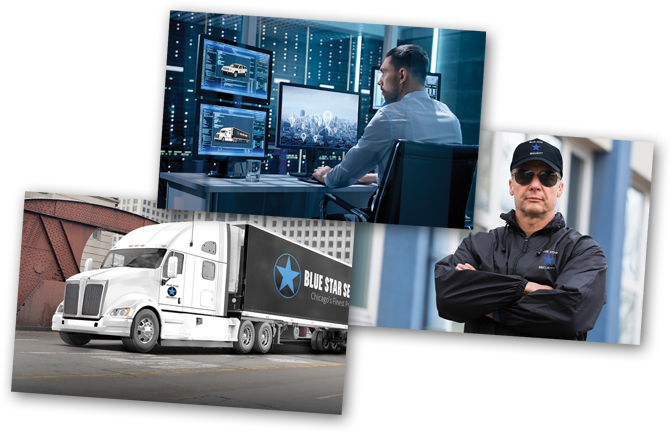 Blue Star Security will help protect your people, your physical assets, your corporate data and your intellectual property on a global scale.We live in a world where workplace protection, cyber security and other threats present a constant challenge. Before you hire the first employee, you should establish a Code of Conduct. This document should outline what is acceptable or proper behavior within office premises and what repercussions there will be if an employee violates the terms. This document should be accessible to all of your employees at all times. It is best for this document to outline necessary areas, such as, protecting company property and keeping sensitive information safe and within company premises. Protection of your documents should not only extend to the security installed on your computers. It’s safer to schedule a weekly or monthly shredding of documents. This way everyone will be used to setting aside documents for shredding ahead of time. To place a level of security on documents and information, schedule audits annually. This means you will be able to check on documents kept by your employees both in paper form and in their computers. After you’ve done the audits, it will allow you to identify areas where security can be improved. After identifying the areas where security can be improved, see what can be done about it. Do not put it off! Putting it off will allow the possibility of weakness in your security to be exploited. Whether your business utilizes one computer or a network, it is best you designate a username for each individual user. Following this, you should also limit the access of the profile of your employee. This not only guarantees you know what your employee can access but it also ensures that you will not have problems when it comes to any unauthorized changes that might be made. Protecting the password of each user is also a must. The strongest passwords contain the following: a capital letter, a number, and a special character. It is also recommended that passwords should be changed after 30 or 45 days. If employees are not at their desks, make it a requirement that they lock their computers to avoid unauthorized access. Whether you are at home or at the office, you should already have set emergency plans. Your safety plan should include a list of contact numbers for the police and emergency services. Also, an evacuation plan should also be outlined and displayed in a prominent area where your employees can view it and familiarize themselves with it. It’s also a good idea to provide reminders or safety tips periodically to employees. Investing in a good security company is recommended. But, before you get this option you can make sure that all doors, windows and storage areas have their own locks, keys, and cameras, and they are properly monitored. Your office should also be located in an area that can be seen from the street easily, since most thieves or burglars are attracted to businesses that are hidden from view. If your business is hidden from view, an audio alarm might help to reduce the risks of not being seen easily. Adequate lighting is important not only for the interior of your building, but it is also a must for the exterior. For your office space, always leave a light on when you leave for the night, so that way police or security can see into it. Always maintain good lighting on all doors and throughout the parking lots. This precaution is simple but it not only keeps your space safe but it also keeps your employees safe if any need to extend their hours into the night. If you’d like additional tips on protecting your people, physical assets, corporate data and intellectual property then call us today at (708)669-7470 or fill out our Contact form.